Director Tate joined The Day on the Hill with over 500 Tennessee Intercollegiate State Legislature delegates representing over 44 college and universities. This program offers college students the opportunity to learn about state government, the political process, and to appreciate other viewpoints. State officials who are TISL graduates include Secretary of State Tre Hargett (TISL Governor 1993) and Tennessee State Treasurer David Lillard (TISL Governor 1976). TISL members of the Judicial Branch include: Chief Justice Jeff Bivins, Justice Holly Kirby, former Justice Penny White, Judge Frank Clement Jr., Judge Neal McBrayer, Judge Dee Gay, Judge David Mason, former Judge Mike Faulk, Judge Todd Burnett, and Judge Ronnie Greer. Read more about the Tennessee Intercollegiate State Legislature here. 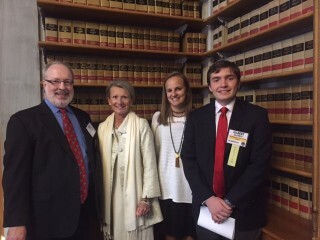 TISL Executive Director Jeff Wilson, AOC Director Deborah Taylor Tate, Sewanee intern Emma Reineke, and student participant Gilbert Gilchrist.